All 409 miles of climbs, descents, twists, and turns of the six-day Larry H. Miller Tour of Utah have been revealed by event organizers. The sixth season for this prestigious professional cycling event will begin with a new uphill Prologue at Utah Olympic Park on Tuesday, August 9. Four of the five stages also provide fresh territory to challenge pro athletes and entertain spectators, including new routes for the road race in Ogden and the circuit course in downtown Salt Lake City. The Tour of Utah culminates on Sunday, August 14, with its signature mountain-top finish at Snowbird Ski and Summer Resort. "The route this year will definitely challenge the best cyclists from around the globe. We expect each course to be packed with spectators, while enjoying the striking parts of the state of Utah and the local communities. Six days of challenging courses and terrain will not only test pro cyclists, but showcase Utah in a national and international spotlight," said Steve Miller, president of the Utah Cycling Partnership which owns the Tour of Utah. Two special events for cycling fans have been planned to promote this year's race. Embracing the popularity of this month's Tour de France, a live broadcast of Stage 19, with its classic mountain-top finish on L'Alpe D'Huez, will be shown at the Megaplex 12 Theatre at the Gateway in Salt Lake City. This viewing event, which is free to the public, will be on Friday, July 22, 6 a.m. to 9:30 a.m. Mountain Time. The second event for race fans will be a Team Presentation event on Sunday, August 7, at the Swaner EcoCenter at Newpark Town Center in Park City. Tickets ($50 each) are now available for a private reception sponsored by Exergy Development prior to team introductions, which will be 6-10 p.m. The six-day race and rolling festival was elevated this year by the Union Cycliste Internationale (UCI) to a 2.1-rated stage race, which makes it one of the top three pro cycling events of its kind for North America. The Tour of Utah promises to uphold its distinction as "America's Toughest Stage Race with close to 30,000 feet of climbing over the total route, as well as providing stunning scenery along the Wasatch Front in and around six unique Host Venues. The Overall Start on August 9 debuts at legendary Utah Olympic Park (UOP) in Park City with an uphill Prologue, presented by KJZZ-TV and KFAN (Sports Radio-AM 1320). The Prologue, a short preliminary time trial to establish the race leader, will cover 1.25 miles (2 km). But it won't be a full-throttle sprint, as the pro cyclists will have to climb the entire distance. The start will be located at the Joe Quinney Winter Sports Center, which houses the Alf Engen Ski Museum and 2002 Eccles Winter Olympic Museum. The finish will be located at the summit of UOP, near the start house of the sliding track used for bobsled, luge and skeleton. This acclaimed 389-acre facility has been recognized as having the fastest sliding track and highest-elevated ski jumps in the world. The stage will begin at 2 p.m. and end at approximately 4:30 p.m. The Stage One Road Race, presented by Miller Lite, is a completely new course and is the longest stage of the week at 116 miles (187 km). This start and finish line on Wednesday is located in downtown Ogden on Historic 25th Street near the Ogden Amphitheater. Pro cyclists will encounter 8,250 feet of climbing, navigating a 38.5-mile course three times. This includes multiple climbs over the challenging North Ogden Pass, traveling past Pineview Reservoir and returning to Ogden through Ogden Canyon. This makes it a great day for spectators to see the peloton pass numerous times. It is the first time Ogden will host a start and finish for the Tour of Utah. A climbing stage with a flat finish, it will begin at 11 a.m. in Ogden and is expected to finish between 3:45-4:30 p.m. The Stage Two Road Race, presented by Adobe, provides a rolling, 100-mile (161 km) course that offers a new finish line area in Provo. For the second year in a row, the start line of this stage is located at the headquarters of XANGO (a leading global nutrition company) on the north side of Utah Lake, less than 20 miles away from Provo. The peloton will encounter 2,820 feet of rolling hills as they ride around the west side of Utah Lake, passing through Goshen Canyon and the towns of Mona, Santaquin, and Springville. After passing near Brigham Young University in Provo, cyclists will finish at Vivint headquarters (one of the largest home automation companies in North America) at The Shops at Riverwoods on North University Avenue in Provo. This is the first time in four years that Provo is an official host city. The start will begin at 11 a.m. and the finish should be between 2:45-3:30 p.m.
Miller Motorsports Park will host the Stage Three Individual Time Trial, presented by UnitedHealthcare, on August 12. It is the fourth consecutive year this "race of truth" will be contested near Tooele, Utah at this state-of-the-art road racing facility completed in 2006 for automobiles, motorcycles and karts. This year's official start and finish areas are in close proximity to one another, both front of the facility's pit row area. At 9.7 miles (15.6 km), the time trial course has 20 turns on the race track, including one out-and-back section and a turnaround area within walking distance of pit row. In this exciting event, cyclists take turns racing against the clock, going at intervals on the course rather than a large peloton, or pack. Because of high temperatures that occur on the race track in the middle of the day, the athletes will begin taking turns in the ITT at 5 p.m. The competition should conclude by 7:30-8 p.m.
A new course is expected to draw huge crowds on Saturday, with the Stage Four Circuit Race, presented by University of Utah Health Care, in downtown Salt Lake City. The Prologue has been hosted by Salt Lake City in past years, but this year the capital city has planned a high-intensity 81.4-mile (132-km) race with a total of 7,246 feet of climbing. The circuit is 7.4 miles in length, which will require cyclists to make 11 laps. The course begins on Capitol Hill and continues through City Creek Canyon. It continues along 11th Avenue through the Avenues neighborhood and south on Virginia Street into the Federal Heights neighborhood. The peloton should fly along tree-lined Presidents Circle on the University of Utah campus then sprint along South Temple Street, past the Governors Mansion and under Eagle Gate to Capitol Hill for the finish. The circuit race begins at 1 p.m. and is expected to finish at close to 4:30 p.m. The Tour of Utah returns to Park City on Sunday for the start of the Stage Five Road Race, presented by Zions Bank. This is the showcase "Queen Stage" of the Tour with the epic mountaintop finish at Snowbird Ski and Summer Resort. It is the fourth consecutive year for this century (161-km) route, which features four significant mountain climbs and a total of 10,900 vertical feet of elevation gain. Going east from Newpark Town Center in Park City, one of the first climbs is along the Jordanelle Reservoir near Kamas. The next major climb is past Midway along the Alpine Loop Scenic Byway, an 8.7-mile climb that crosses Mt. Timpanogos near Sundance Resort. After a descent down American Fork Canyon (Hwy. 92) through Uinta National Forest, riders head over the Suncrest Drive climb and past Sandy City. The final climb up Little Cottonwood Canyon covers 3,000 vertical feet in six miles, with 8-12 percent gradients, to the finish at Snowbird Ski and Summer Resort. The Larry H. Miller Tour of Utah began as the Thanksgiving Point Stage Race & Cycling Festival, a three-day event over Memorial Day weekend in 2004. 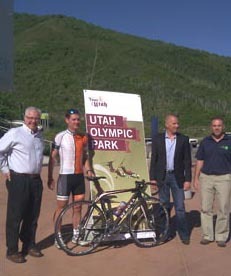 The Utah Cycling Partnership, owned by family members from the Larry H. Miller Group of Companies, purchased the event in 2007 and re-launched the cycling event in 2008. The race had grown from 9,000 feet of climbing to nearly 30,000 feet of elevation gain. The Tour of Utah is now sanctioned by both USA Cycling, Inc. and the UCI. The Larry H. Miller Tour of Utah continues to be free to all spectators, making professional cycling one of the most unique pro sports in the world today. Pace Line Club VIP Packages are now available for purchase online. The Podium Level package is $500 and includes hospitality tickets for one stage, autographed jersey and additional merchandise. Packages priced from $5,000 and higher provide tickets to multiple stages, overnight accommodations and special merchandise. All Information about VIP Packages, The Ultimate Challenge, and Host Venues can be found by visiting www.tourofutah.com, with updates on Facebook, Twitter, and YouTube.